Cosy and independent house with splendid view on Pescia! The house is equipped with all amenities you may need and is comfortably furnished. It is located in a rural area and is surrounded by woods and olive groves. Guests can enjoy a private swimming pool (12 metres x 6 metres) and sunbeds. You can sit on the covered terrace and prepare delicious meals by using the barbecue and the wood-fired oven, ideal for making pizza! Inside the property you will soak up the authentic countryside atmosphere, while enjoying all comforts. The living room features a satellite TV with DVD player and the kitchen is equipped with a dishwasher, an oven, a microwave oven and all other amenities. The multi-level garden is fenced, so that children can safely play basketball and ping-pong. It is the ideal accommodation to have fun and enjoy great Italian food and wine! 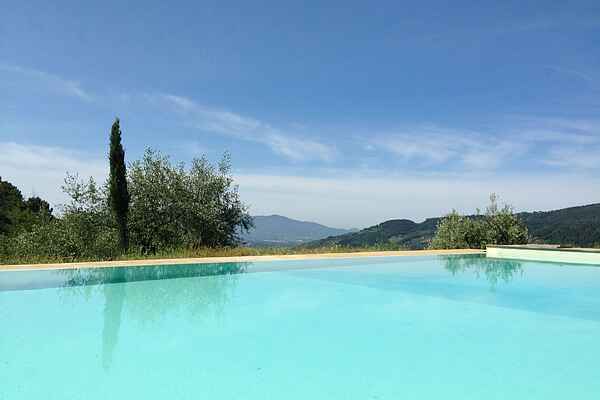 The property is located only 5 km from Pescia's town centre, where you can find several shops and excellent restaurants. There are also many possibilities if you decide to go on a day trip - for instance the old part of Collodi is quite picturesque with the view of the houses on the hillside! The famous Leaning Tower of Pisa is also only 45 km away, as well as the thermal city of Montecatini Terme (7 km), which even offers a 18-hole course for golf fans. Pistoia is 25 km away and the medieval city of Lucca 15 km away. For a beach day, Viareggio's shores are only 40 km away, while for all culture and art lovers, Florence is 50 km away.